What are the circumstances in which you may want to copy data to another workspace? If you are hoping to accomplish one of the above, then this is the solution for you. Here's how. You will need to copy your workspace. The copy will serve either as the second review round workspace, or as the archival workspace. 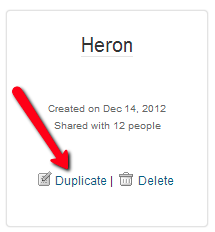 On your My WizeHive page, find the workspace in question and click duplicate. On the subsequent screen, you can name your workspace and select which aspects of the workspace you would like to be copied. You might name is Heron Review 2, or Heron Archive, for instance. When you are ready, click Copy. You may have to wait up to 5 minutes for the copy to complete, and it is suggested that you log out and log back in in order to see the copied workspace. 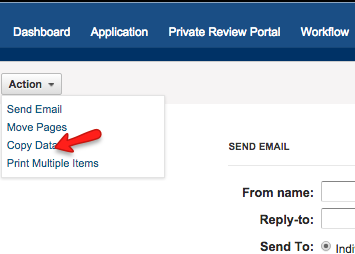 Note: It is crucial that you do not add/remove/change any fields in the forms at this point. The data copy will be effective only if the forms are exactly the same. If you are attempting to copy data to a form which has been changed, please see How To: Copy Data to Another Workspace Via Workflow. Now return to the first workspace and navigate to the Actions tab. From the Action dropdown, select Copy Data. When you press Copy Data, you should be brought to this screen. The origin workspace will automatically be set to the workspace you are in. Next, select the Folder and Form which contain the data you'd like to copy. On the right side, you will be selection the destination workspace, folder, and form. 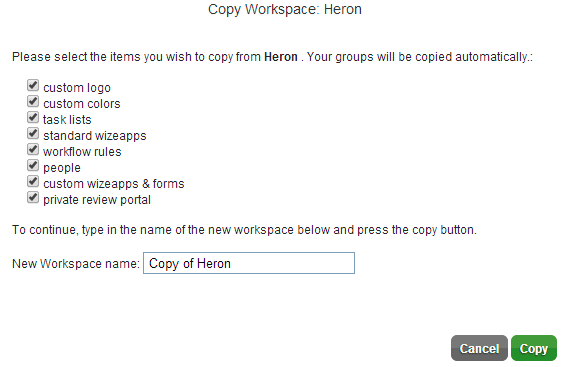 The folder and form should be exactly the same; the workspace should be the one you duplicated and created in Step 1. At this point, the fields from the original workspace will appear on the lefthand side, and the fields in the new workspace will appear on the right. Quickly glance to make sure the fields are lined up. 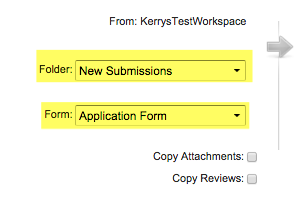 Finally, decide if you want to copy reviews and/or attachments along with the data. Click the appropriate checkbox(es). Click Copy in order to set the Copy in effect. It make take up to 15 minutes depending on the volume of data you are attempting to copy.